This year, 418 of the 626 HEI 2018 survey respondents (67%) scored 100 in the HEI 2018 and acheived the coveted status of "2018 LGBTQ Healthcare Equality Leader." Another 95 facilities earned the “Top Performer” designation for scoring 80 to 95 points. With 82% of participating facilities scoring 80 points or more, it is clear that healthcare facilities are going beyond the basics when it comes to adopting LGBTQ-inclusive policies and practices. In addition to being celebrated in the HEI 2018 report, Equality Leaders receive a special logo and a toolkit of resources for outreach to LGBTQ residents in their service area. 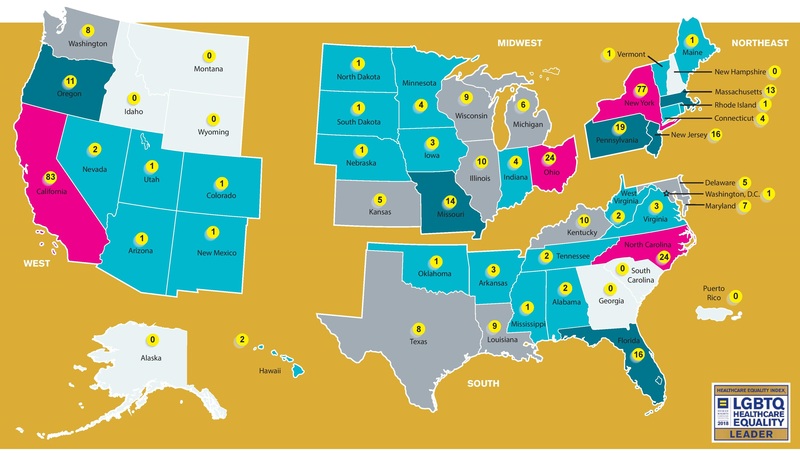 While there are 7 states and Puerto Rico, that do not have Equality Leaders this year (Alaska, Georgia, Idaho, Montana, New Hampshire, Puerto Rico, South Carolina and Wyoming), the map above illustrates that Leaders are fairly distributed throughout all regions of the country. We have seen tremendous progress toward LGBTQ equality over the past decade, yet LGBTQ Americans still lack federal civil rights protections. Without these protections, we are left with a patchwork of state and municipal laws that leave many LGBTQ people vulnerable to discrimination in their workplaces, healthcare facilities, schools and communities. This year, the HEI 2018 features the profiles of Pennsylvania and Ohio, states that lack LGBTQ protections yet have an abundance of healthcare institutions that have stepped up to ensure that the LGBTQ people in their states have inclusive and welcoming care when they need it. Pennsylvania is one of twenty-seven states in the U.S. that ranked in the lowest-rated category, “High Priority to Achieve Basic Equality,” in HRC’s 2017 annual State Equality Index. With 34 facilities participating in the HEI, Pennsylvania ranks 3rd overall among states in the number of HEI participants and ranks 5th among states in the number of LGBTQ Healthcare Equality Leaders, with 19 facilities. Ohio also is one of the twenty-seven states that ranked in the lowest rated category, “High Priority to Achieve Basic Equality,” in HRC’s 2017 annual State Equality Index. With 27 facilities participating in the HEI, Ohio ranks 5th overall among states in the number of HEI participants and is tied for 3rd among states in the number of LGBTQ Healthcare Leaders, with 24 facilities.